CD reviews: "Super Blues," "The Super Super Blues Band" and "Two Great Guitars"
Why bother trying to repackage the already hip? These three CDs  MCA reissues of albums from the Chess catalog  are from the mid- and late 1960s, and represent Chess' efforts to markets its artists to a younger, whiter audience: au audience then purchasing record albums at a previously unheard-of pace. The marketing ploy was simple  pair various Chess artists together in an informal jam session, throw (in the case of the two of the albums) some psychedelic art on the cover, and give it a snazzy name. Still, perhaps because their music and backgrounds were similar  black musicians from the blues/R&B circuit who had been embraced by an entire generation of dance-happy white kids  the Berry-Diddley pairing works better than the other two efforts matching Diddley with blues artists. The two Super Blues sessions are much rougher at the seams. 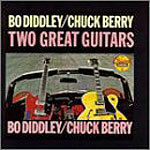 Diddley and Muddy Waters never really seem to hit a common groove, and often seem to be going in different directions. 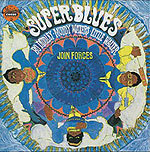 The second of the two, "The Super Super Blues Band," seems more focused, probably because the more flexible Howlin' Wolf had replaced Little Walter. Wolf and Diddley shared a common approach to the music (intense bordering on manic) that seems to provide a bridge for them to meet on. On both, of course, Waters does his thing as best he can in uncomfortable surroundings (shades of "Electric Mud"). These are interesting albums, although probably only "Two Great Guitars" is fairly representative of the artists' music. But the executives at Chess would have been better served to trust the fans of the Beatles, Rolling Stones and Elvis to accept these blues (and, in the case of Berry and Diddley, early rock) artists on their own merits without trying to change the music to make it more acceptable. After all, you can't improve on the truly hip.